An old Queenslander home has had a slab poured underneath it and around three sides for extensions. This job was tackled with just a .3m Bull Mixa concrete mixer and the whole job involved 47 cubic metres of concrete. This saved the owner thousands of dollars over employing a truck to deliver the concrete. Usually the more remote a site, the least work is done on it. Facilities are often poor. The Self-loading concrete mixer made short work of repairs to and extending the concrete apron around this water trough at these cattle yards. The benefits are both in the immediate and in the long term. Along with the cattle water trough above, a whole set of yards built from railway rails and concreted in, was constructed with longevity in mind. 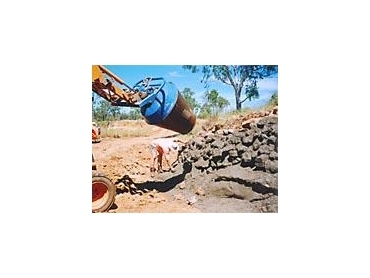 What could have been a back-breaking job wheeling a full barrow on concrete mix to each hole, was simplified with mobile Bull Mixa concrete mixers, which made short work of it. In the Charters Towers region, the rock-faced support to a road bridge had given away. The Bull Mixa Self-loading concrete mixer, attached to a front-end loader, was able to get up high and get supporting concrete in those hard to reach places, repairing the banking quickly and efficiently.